A Filling. Broken or decayed teeth can often be restored or rebuilt with bonded dental fillings. Replacement fillings can also be used when an old filling has broken or has fallen out. In most instances, the dentist will simply need to numb the area around the selected tooth and bond the filling into place. Root Canal and Crown. Severe tooth decay that has reached the nerve tissue inside of the tooth can weaken the enamel and trigger an infection. The dentist can clean out the infected nerve tissue and refill the interior of the tooth with a sterile filling material. Next, a sturdy dental crown can be fitted on top of the tooth to restore the shape and increase the tooth’s strength. Drainage. A dental infection that has resulted in a bump or pimple in the gums can cause pressure, pain, and swelling. The bump or pimple, known as an abscess, can be drained to provide immediate relief from the pressure. An antibiotic is also typically prescribed to control the infection. Additional treatments such as a root canal procedure or a tooth extraction will also be required in the near future to prevent the infection from arising again. 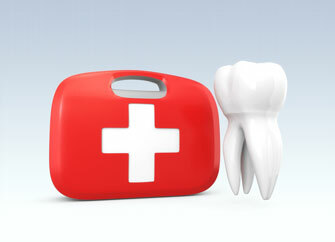 During an emergency, the dentist will take the appropriate steps to get you out of pain. Once the situation has been stabilized, you might be referred to a specialist, prescribed certain medications, or advised to return to the dental office for follow-up treatments. Be sure to follow your dentist’s instructions as carefully as possible to ensure that you can remain healthy and free of pain. For more information on how Delano MN dentists treat dental emergencies, call to schedule an appointment today.